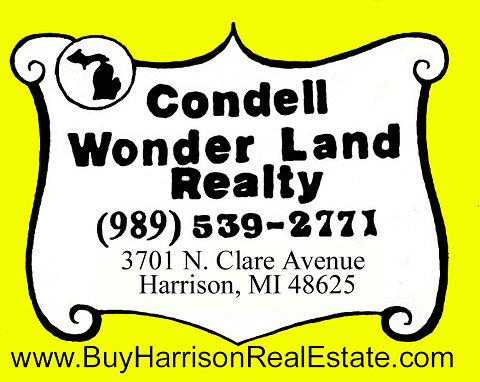 Condell Wonder Land Realty’s has been serving Harrison, MI. and the surrounding area for over 25 years. We are one of Harrison's oldest Real Estate Offices. If you are looking to Buy or Sell, we are open 7 days a week and will give you the service you deserve! Please feel free to contact us if you have any questions about the Harrison, MI real estate market, or buying or selling a home in Harrison, MI. We are open 7 days a week, give us a call, send us an email, or stop in to see us. Condell Wonder Land Realty is conveniently located just off Hwy, US-127 between Clare and Houghton Lake. We are approx. 175 Miles N. of Detroit, 95 Miles N. of Lansing, 106 Miles N. of Flint, 133 Miles N. of Jackson, and 95 Miles N. of Owosso. We are truly located in a Northern Michigan playground with great fishing and boating on our 20 Lakes within 20 minutes of town, hundreds of acres of State Land, ORV & Snowmobile Trails, Downhill Skiing, Muskegon River, many Golf Courses and much more! Our Office is located 3/4 miles N. of Wilson State Park and Clare County Fairgrounds on Old US-127 in Harrison MI. Thank you for visiting Condell Wonder Land Realty! Let us be your one-stop real estate website for all your home buying and selling needs in Harrison, MI. We have a very professional, experienced and knowledgeable staff of Harrison MI. Realtors, real estate agent who will help make your search for a new home an enjoyable experience.